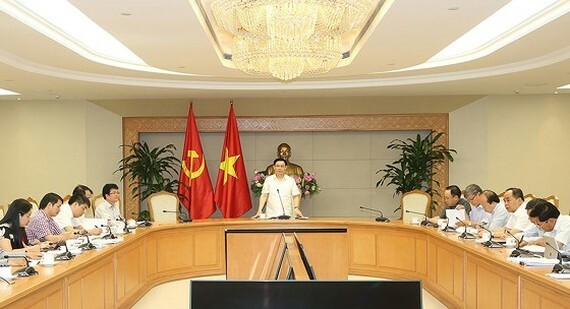 A meeting between Deputy Prime Minister Vuong Dinh Hue and the Ministry of Health, the Ministry of Education and Training, and the Ministry of Culture, Sports and Tourism was convened on medium-term public disbursement of public investment. At the meeting on May 24, Deputy PM Hue urged the three ministries to quickly address their slow disbursement of public investment. In 2018, the Ministry of Health must disburse VND5,260 billion ($230.8 million), the Ministry of Culture, Sports and Tourism is assigned to disburse VND337 billion ($14.7 million) meanwhile the Ministry of Education and Training has to disburse over VND1,300 billion ($57 million). By April, 2018, the disburse rate in health sector is 1.36 percent, the Ministry of Culture, Sports and Tourism 6.28 percent and the Ministry of Education and Training 17 percent. No ministry has disbursed foreign investment. Mr. Hue said that works on construction projects of Bach Mai No.2 and Viet- Duc ( Vietnam –German ) hospital have been halted for 18 months as examples. He said though patients moaned of overloaded hospitals and government allocated an amount of investment, the ministry slowly disbursed investment. Deputy PM Hue said the two projects are examples of weaknesses in public investment. Therefore, he asked ministries to explain the reason as well as pinpoint the government or the heads of the ministers, deputy ministers’ responsibilities for the delay. Deputy Health Minister Pham Le Tuan said that disbursement rate of the Bach Mai II Hospital project is 76.66 percent attributing the slow disbursement tempo to design regulations including estimation. After estimation and design are complete, it will be approved for disbursement. The rate of disbursement of Viet- Duc (Vietnam – German) hospital is 56 percent, said the deputy health minister. The Ministry has submitted report to the PM proposing to last the project till 2019 when it will finish estimation. The ministry will launch a bid of equipment in the third quarter. A representative from the state treasure said that VND1, 066 billion has been disbursed for Bach Mai hospital project while VND1,095 billion has been disbursed on Viet- Duc ( Vietnam- German) hospital. However, it said it has revoked VND1 trillion as advance capital for the projects. Deputy Minister of Investment and Planning Nguyen The Phuong said VND3,200 billion has been allocated for the two projects. Furthermore, the government has reclaimed land for the projects; accordingly, the Ministry is responsible for running the projects. Mr. Phuong added that as of October 31, if the Ministry of Health has not still approved the three projects, the Ministry of Investment of Planning will petition the PM to transfer fund to other projects. Three official development assistance-funded projects of the Ministry of Education of Training have hiccups along the way. Deputy Finance Minister Huynh Quang Hai said that PM has given the green light to transfer fund of slowly-disburse projects to other projects not to wait any more as per Public Investment Law. Deputy PM Hue announced to cancel the estimation of three construction projects for the second facility of the Children Hospital, the second facility of the National Maternity hospital and the Cancer hospital if the Ministry of Health still delays approval of the investment policies. He requested ministries, particularly the three above-mentioned ministries, to figure out reasons, and define the responsibility of the heads of the ministries as well as individuals and organizations involved in the slow transfer and disbursement of public investment; hence, it caused a waste in public investment. For the Ministry of Health’s five projects which used government bond, the Ministry must carry out bid to select contractors for the implementation in the second quarter.